Earlier this year, Leeds was announced as one of the first places in the UK to benefit from a multi-million pound investment in ultrafast speeds by Openreach, the UK’s largest telephone and broadband network. As well as adding even more reliability and resilience to broadband connections and making them less likely to drop out, Full Fibre is capable of bringing speeds of up to 1 Gbps – about 22 times faster than the current UK average of 46Mbps – to tens of thousands of local homes and businesses. 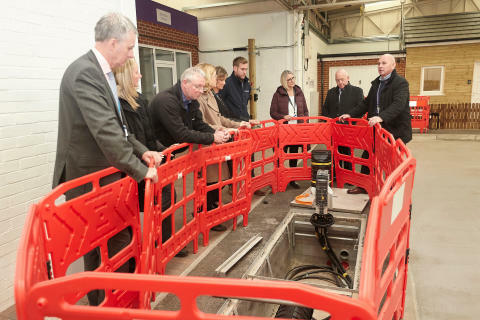 As part of the visit to Openreach’s training school in nearby Bradford, guests were able to take a closer look at some of the technology that’s being used across the 165 million kilometres of Openreach’s network, including trying their hand at joining fibre cables together. Engineers were also able to explain how cutting-edge technology being used in Leeds meant most of the work taking place to build the ultrafast network can happen without needing to dig up roads and pavements. This means the work can be completed quickly and with minimal disruption to people living and working in the city. “Leeds City Council were pleased to take up the offer of a visit to the Openstreet training facility in Bradford. We welcome Openreach’s investment in the Fibre Cities programme in Leeds which will support our ambition for everyone to be able to access gigabit capable services. Our Connectivity Board will have oversight on this work and we used the visit to see the practical impacts of the investment programme on roads and pavements in the district. “We had the opportunity to consider how full fibre deployment might positively impact on some of our priority neighbourhoods and our social housing portfolio. The visit also underlined the investment in training capacity Openreach are making which is again most welcome. We want to work with Openreach to ensure that as many people as possible from in and around Leeds are able to take advantage of these opportunities”. Ultrafast broadband provides even greater capacity for multiple fixed and mobile devices and things like on-demand video, Virtual Reality gaming and smart home apps. The fibre connection will future proof homes and businesses for decades to come and ensure that Leeds remains competitive on the national and world stage. Since being announced as one of the original ‘fibre cities’ earlier this year, engineers have been busy building the network and making it available to local homes and businesses. “It is great to hear that our partners at Leeds City Council found the visit informative. When I first met with them earlier this year, I offered the opportunity to visit the training centre as I knew it would go a long way to reassuring them that our work will be carried out in a careful and considerate manner, keeping disruption to local life to an absolute minimum. The work in Leeds is a further boost for the wider area, which earlier this year heard it would benefit from Openreach’s unprecedented recruitment drive: more than 220 new trainee engineers are being employed across Yorkshire and the Humber to help deliver ultrafast broadband. According to the independent website thinkbroadband.com, more than 97 per cent of Leeds homes and businesses already have access to superfast broadband speeds of 24Mbps and above. Openreach is the UK’s digital network business.